Are you a bucket filler or a bucket dipper? Not sure what these are? Well, you see, everyone has an invisible bucket. When it’s full, the person is happy. When it’s empty, the person is sad. A bucket filler is someone who helps fill someone else’s bucket by saying or doing something nice. Like telling Mom or Dad that you love them or giving your teacher a 'thank you' note. A bucket dipper is someone who steals from someone else’s bucket by being mean to them, by bullying them. A bucket filler is a happy person, because when you fill someone else’s bucket, you also fill your own. A bucket dipper is very sad, because stealing from someone else’s bucket also empties your own. Children are not the only ones that need to learn how to be truly happy. It’s all in the bucket, that invisible bucket that follows you everywhere. Carol McCloud has written a delightful story, colorfully illustrated by David Messing. Have You Filled A Bucket Today? 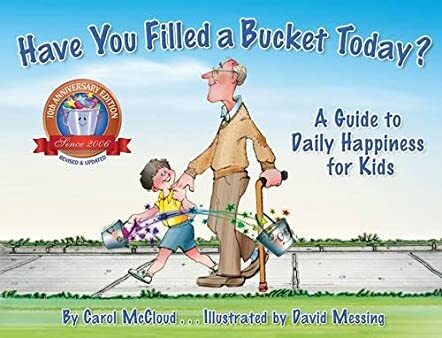 A Guide to Daily Happiness for Kids teaches young readers valuable lessons about giving, sharing, and caring. This guide to daily happiness, though, is not just for kids. We all need reminders of the benefits of positive thinking and positive behavior. It’s an important lesson to teach and remind us all, from time to time, that showing kindness and appreciation of others goes a long way to making this world a happier place for everyone, including ourselves. A classic tale, beautifully told and beautifully shared.